All your herbs will flower at one time or another, and it’s nice to have them contributing to the overall look of your flower or vegetable beds. Chives for example put on a lovely show of purple balls, so why isolate them when they’d look lovely with anything red or yellow or white–or almost any colour. Chive flowers and friendly bee. There’s no way to avoid the presence of precious-plant-eating garden denizens, but there are LOTS of ways to minimize them, and most important of those ways is to attract to your garden the good insects that feed on the bad insects. You do that by planting the plants the good guys like, inviting them to your house. Then they see that you’ve also laid the table with their other favourite foods–like aphid larvae–yum, yum! A lot of flowers attract beneficial insects, but it seems the flowers of herbs are particularly adept at that. Diane’s Flower Seeds has a list of flowering plants that attract bees, butterflies, lacewings (the list of beneficial insects is pretty long…), and the vast majority are herbs. You can see in the chives picture the flowers are attracting bees which are key to pollination. So plant bee-loving herbs near tomatoes or cucumbers or squash. 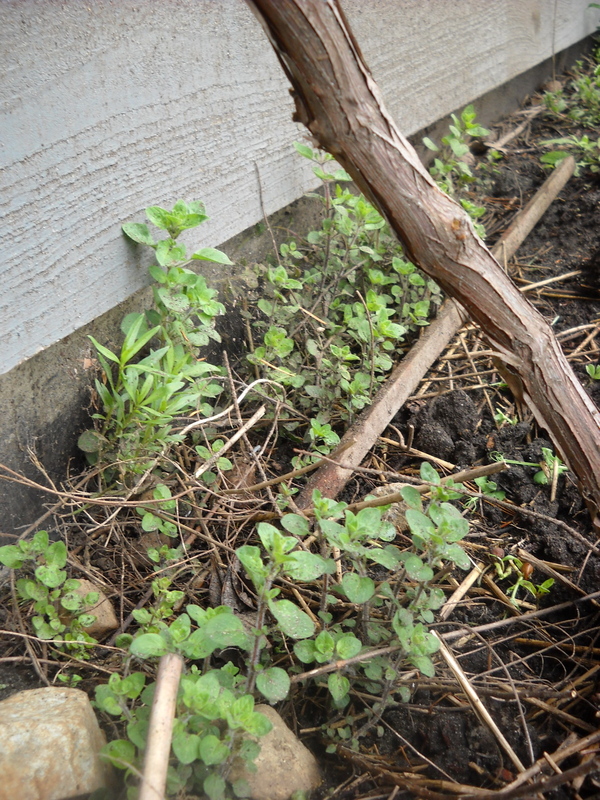 Thyme, oregano, dill, parsley, cilantro, all are herbs that will attract the bees. Some herbs will grow in almost any amount of sun or shade. Lemon balm (Melissa officinalis) is a member of the mint family, which means it’s a THUG. It’ll grow anywhere, take over any space, and outcompete anything that was there before it. But the smell is divine, and makes some kind of therapeutic tea (you can tell I’m a real fan of herbal teas…), so if you want to grow it, just make sure it’s in a container–containing it from spreading. 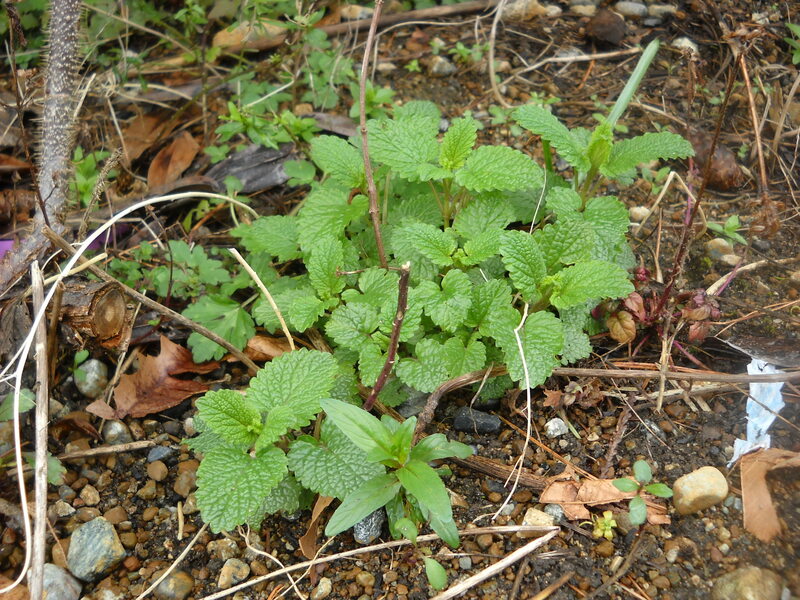 Lemon Balm–I’ve been pulling this out of the garden for three years, thanks to the tenant’s love of herbal teas. Basil (Ocimum basilicum) on the other hand wants FULL sun, and lots of heat. So don’t plant it until our coastal BC nights are over 10 C. That’ll be June at the earliest. Unfortunately for the person with a mainly shady garden, almost all herbs (excepting the afore-mentioned mint family) want at least half-day sun. But if you don’t have outdoor sunny space, maybe you have indoor sunny space–a window sill? Basil will still grow happily indoors as long as that window is south facing with the sun streaming in almost all day. 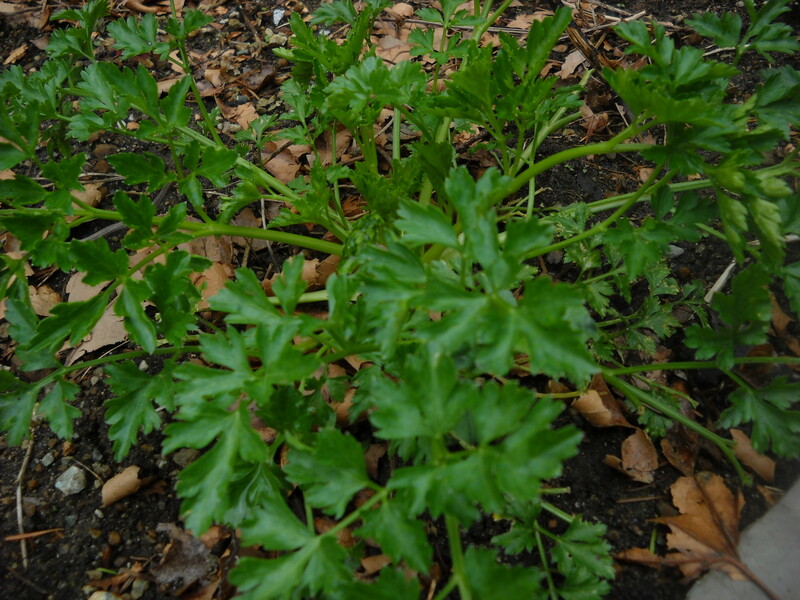 Parsley: EASY to grow, perennial, fabulous rich green colour, hard to kill. 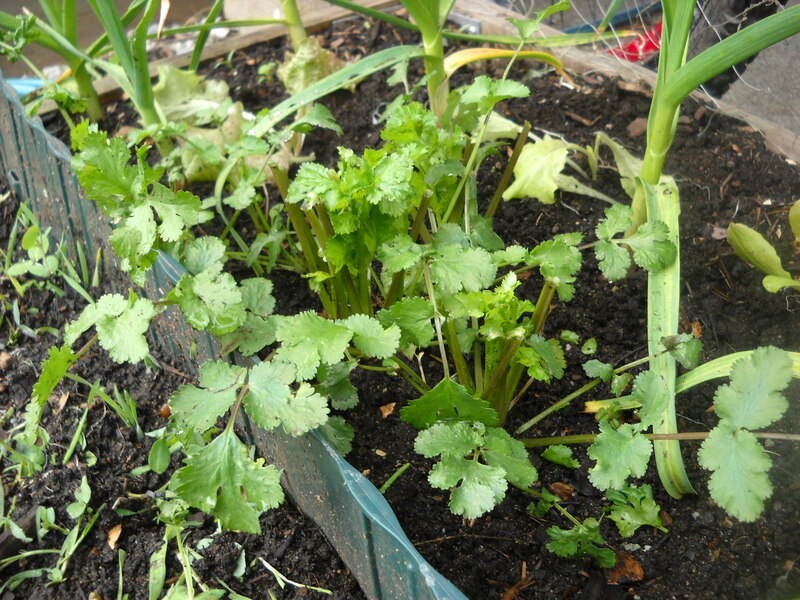 I’ve accidentally dug up the parsley many times thinking it was buttercup, and it always comes back. But unlike the dreaded mint family, it’s quite civilized in its spread. Oregano: even tho’ it’s a Mediterranean herb, indicating full sun and lots of heat, it really will grow in quite a variety of spots, and perennial in our zone. Mine is in the sun until the vegetables grow up in front of it, then it gets lots of shade. It’s still happy as a clam. Growing at the foot of the grapevine in this picture, under roses in another spot. Cilantro: (Coriander sativum) What a brilliant herb. 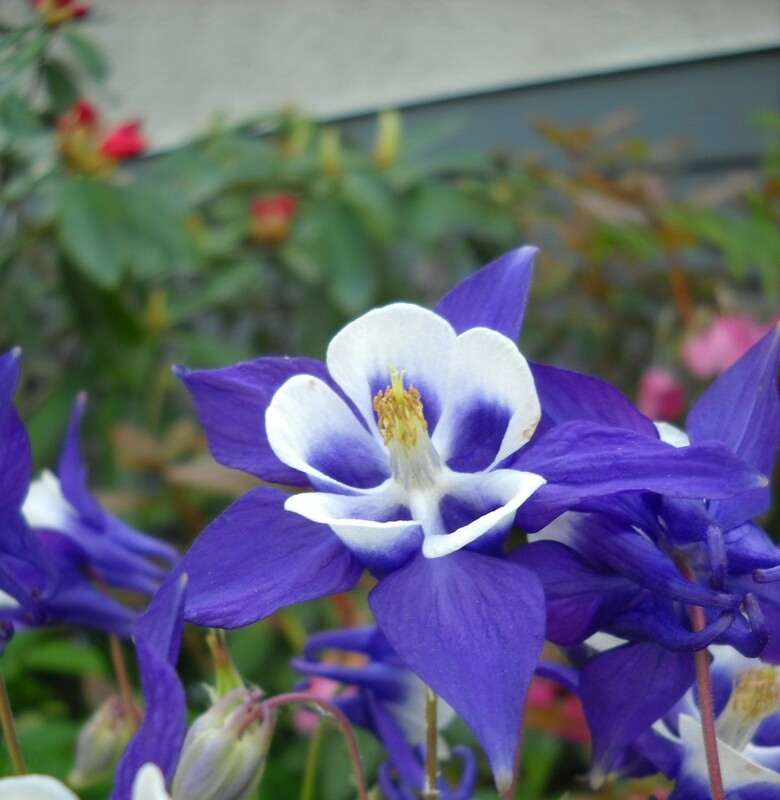 It tolerates cold, so it can be planted as seed really early in the spring. I sowed seed last fall, and it’s coming up now. Once the weather gets warm, it’ll begin to flower, and that’s the end of the cilantro, but not the end of coriander–the seed of the same plant. Wait for the seed heads to get white, and you can collect the seed for cooking or for replanting. But you don’t have to wait for next year to get more, you can keep sowing seed all later summer and fall. Once the nights get coolish again, your cilantro will happily keep putting out leaves. And a little shade from perennials that grow up around it will help keep it cool as the weather warms up–giving you maybe a few more weeks of harvest. The more you take, the more you get. Basil: I just can’t be without it. And when there’s lots and I want to harvest more than I need now (to stimulate more growth–take more and you’ll get more! ), I just put the fresh leaves/stems in a baggy and freeze the whole shebang. Or of course you can make your batch of pesto and freeze it in small portions. Basil won’t survive our winters–in fact it’ll barely survive our Falls. Before the nights get cold you can dig it up and put in a pot in that sunny window. Should be able to get a few more harvests from it. Dill: Wants lot of sun, but it’s another plant that tolerates cool temperatures, and will start to flower as it gets hot, and stop making leaves. So don’t sow all your seed to begin with; sow about 1/4 of the seeds now, then once those flower, start another batch, and every few weeks after that. Rosemary: Another herb it’s hard to be without. Rosemary wants full sun, and altho’ it is perennial in our zone, it’s best to offer it some winter protection in case we get a colder than usual winter. 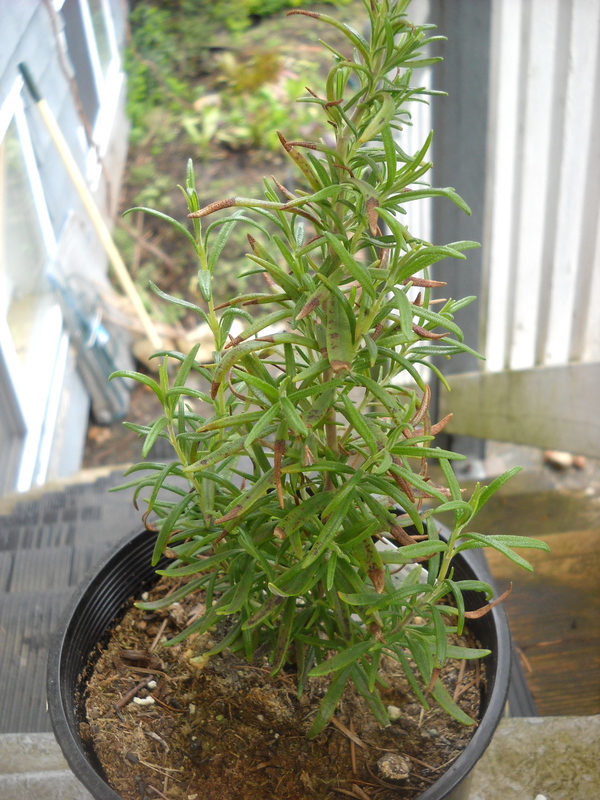 I bought two rosemary plants late in the season last year, and potted them in 1 gallon pots so they could live on the protected porch through the winter. When the soil gets warm I’ll plant them out in the garden. You can see it’s been a little cold-damaged on leaf tips, but it’s happily putting out new growth. This post is already way too long, so stay tuned for the next one when I’ll tell you how you can grow most or all of these in containers. This entry was posted in Fragrance, garden, Herbs, landscape and tagged Basil, beneficials, cilantro, coriander, dill, herbs, lemon balm, needs, oregano, parsley, rosemary, shade, shade-tolerant, sun, sun-loving by Janet. Bookmark the permalink.